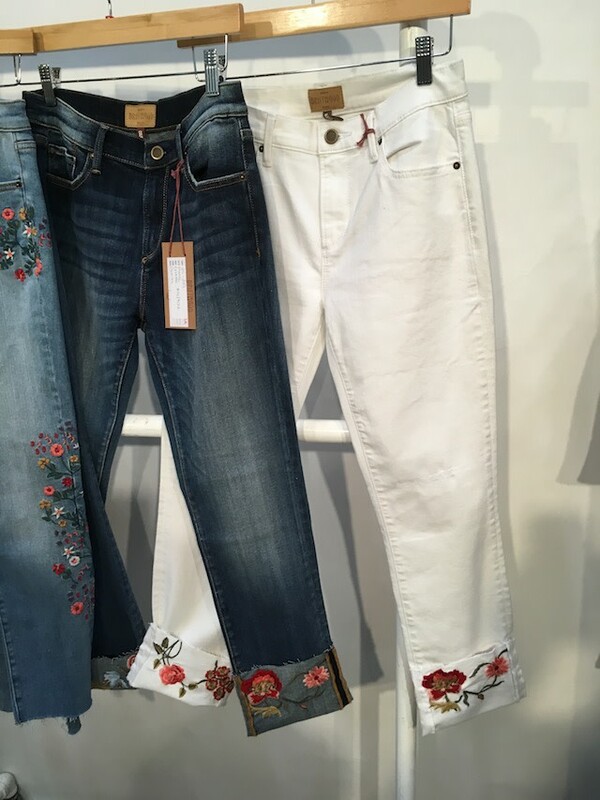 Editor’s Picks: the remarkable brands – new and noteworthy, contemporary to luxury – that are looking really good for Spring/Summer 2018 retail delivery. 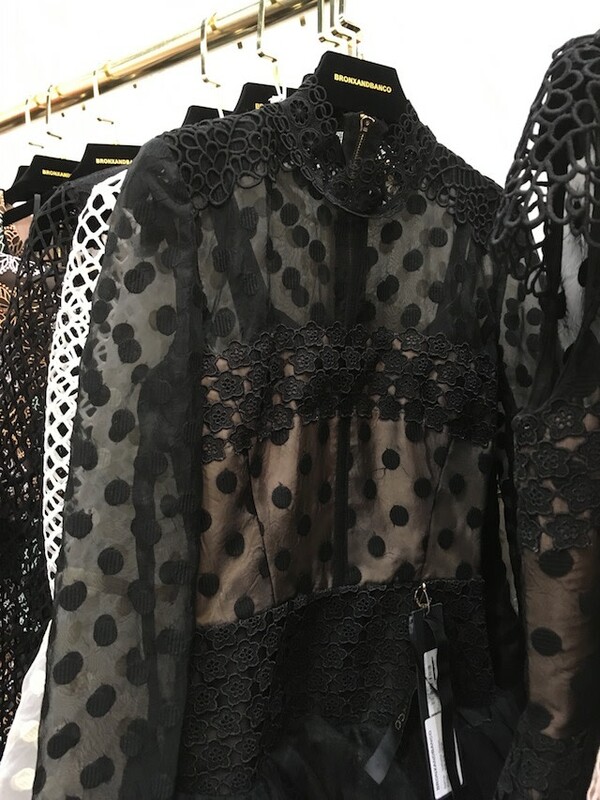 On view, our selections from the September 2017 NYC edition of Coterie and the sister UBM Fashion trade shows that were running concurrently at the Javits Center. The exhibitors we spoke with had their January 2018 ship and forward on display. Almost all of these brands had samples of immediate deliverables on hand for retail ordering. Our editors’ took the challenge to forego the ultra-fem ruffles and flounce as well the “Out of Goa” gauzy chiffons, flowing caftans, and pompoms of BoHo heaven festival wear. We admit, those looks were pervasive at the shows. But, we had eyes for others. 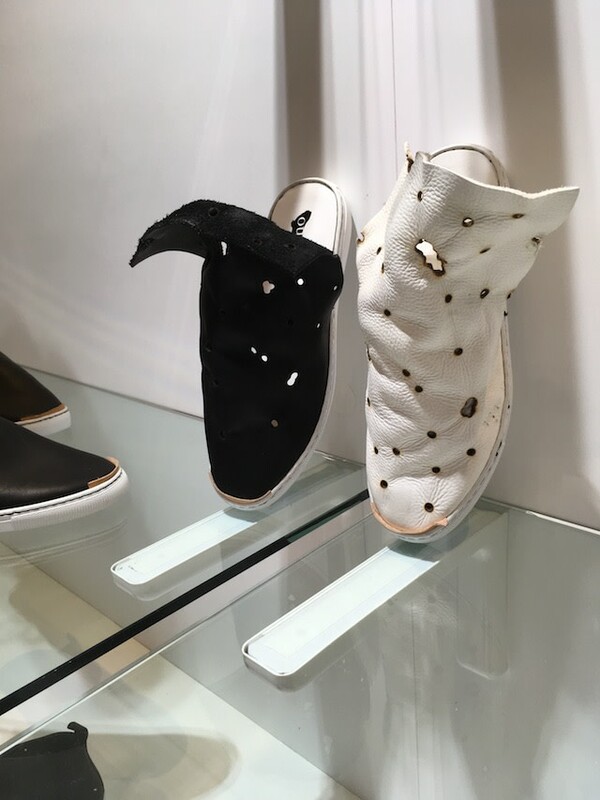 Buyers can make contact with both of these Italian brands through Gruppo Mattei USA, in New York City. 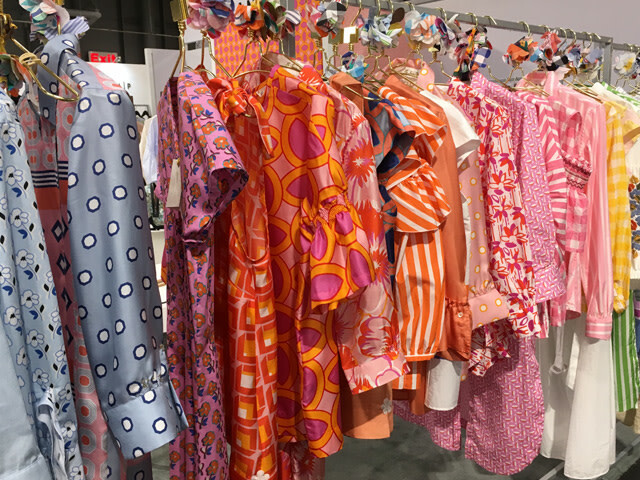 Both feature delicious fabrics, quality craftsmanship and designs with enough flirty details that their booth was humming with non-stop traffic throughout the show. FIRST TIME EXHIBITOR. Being as this was Sarah Alexandra’s first trade show, she had no idea what to expect. 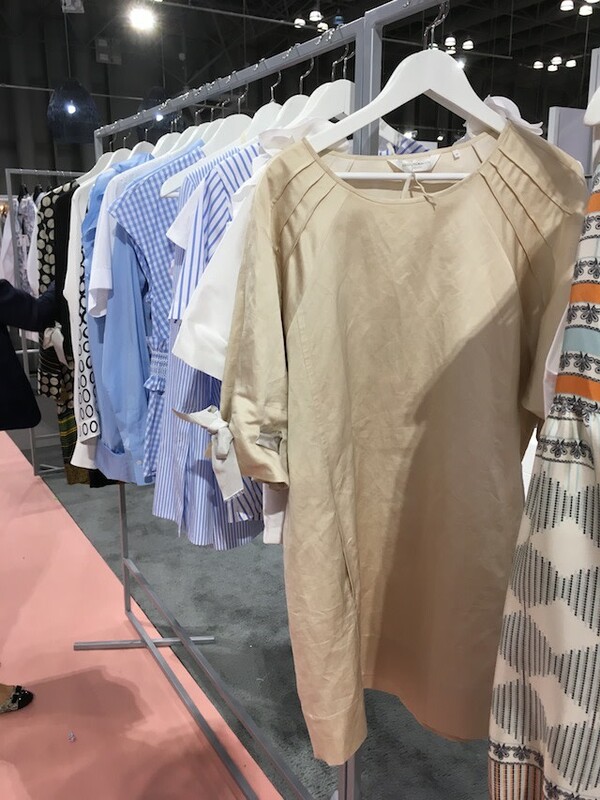 Her shirting, Italian cotton fabrics with a compliment of details, won the hearts and orders from some of the best Haberdashery accounts with Women’s departments in the USA. 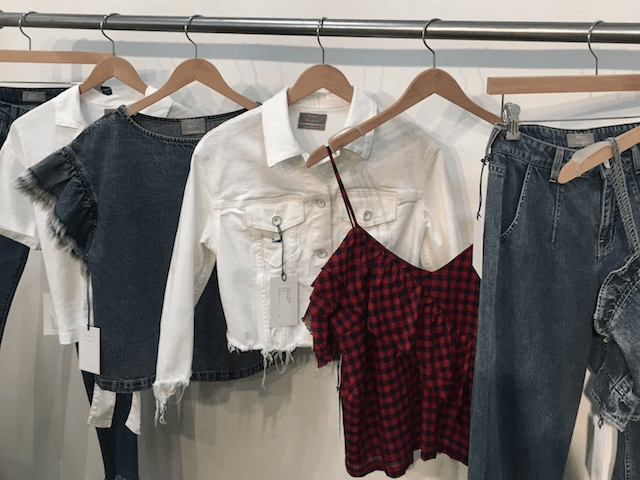 This Los Angeles based denim brand is a father daughter colab. Those of you who are denim aficionados may know of the iconic pattern maker, Jim Man Kim. That’s father. 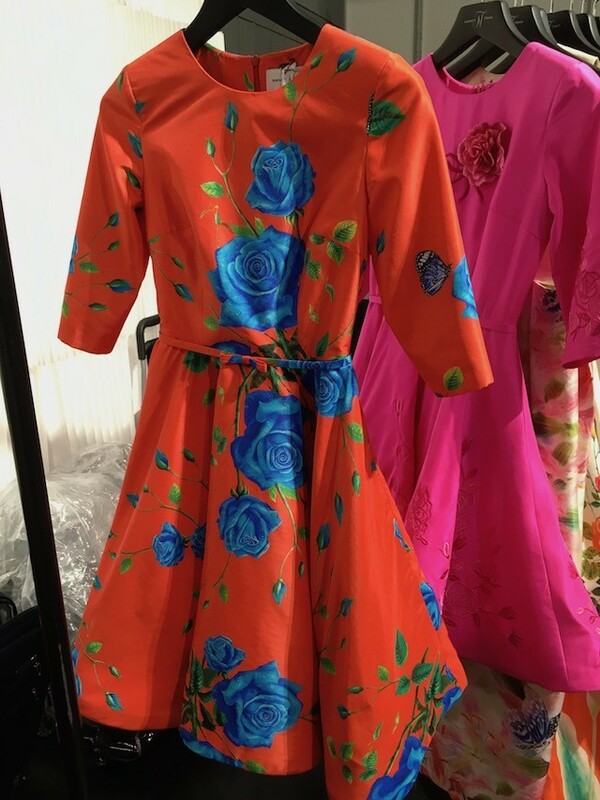 Daughter, Su Kim, is the designer. Together, Father’s Daughter, has created a “little label” that is devoted to quality. The fringed shirt detail has to be touched to be believed, it is dense with a beautiful hand. 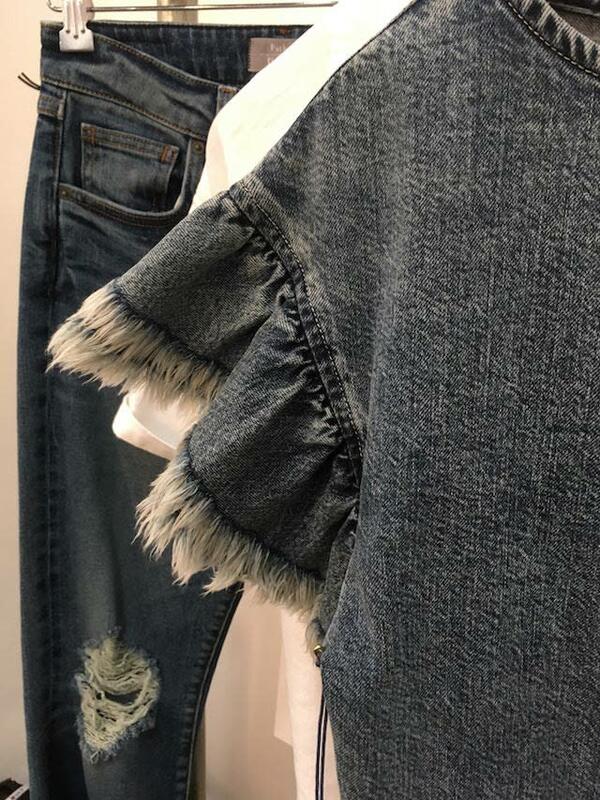 True there is a whole lot of a-lot-of details going on in the denim market, often colliding in one piece. The restraint is what got us with this Driftwood style. The roll-up cuff detail gives a nod to the Boho spirit without all the hyperbole. Visit Simpatico for a first-hand look. Genderless based design is the hallmark of this Korean brand and this season Suuwu expands on its unisex showcase with a play of matte and shine contrasts. 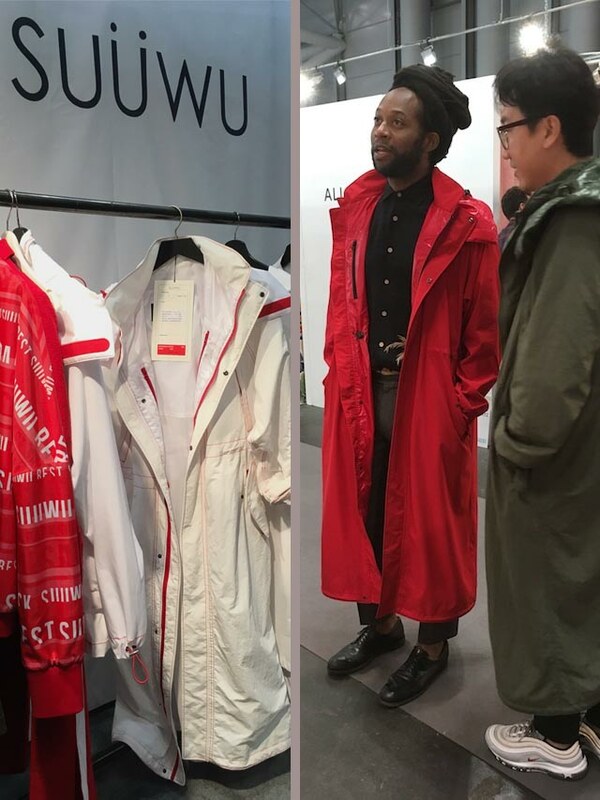 Pictured the owner and an admiring retail buyer (in red) feeling at home in one of Suuwu’s best sellers. The Bronx And Banco brand hails from Australia. Sophisticated yet with a playful sensibility. 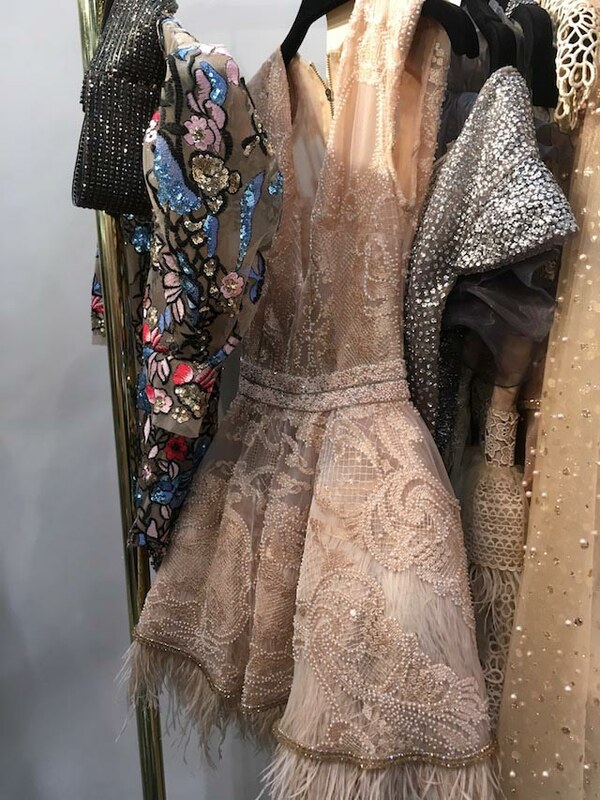 The collection is a gorgeous riot of materials, embellishment, and fabrics. Note the ostrich feather petticoat. Czarina ballerina! 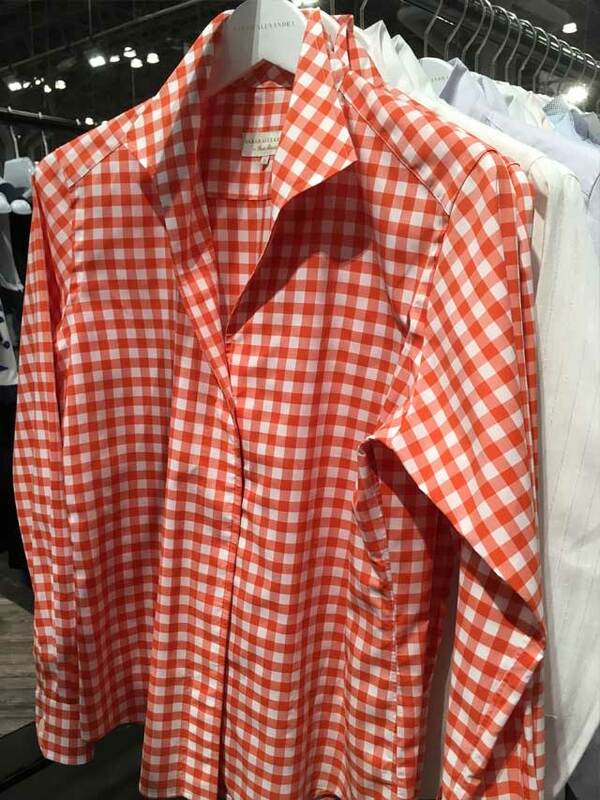 Contact their US sales rep at the Place Showroom, New York or Los Angeles office, to view the collection. A jewel box of a collection, each piece is a work of art. Nancy Tran incorporates her original paintings via digital printing onto lux fabrics to amazing effect, as pictured. Also noteworthy, her embroidered pieces. 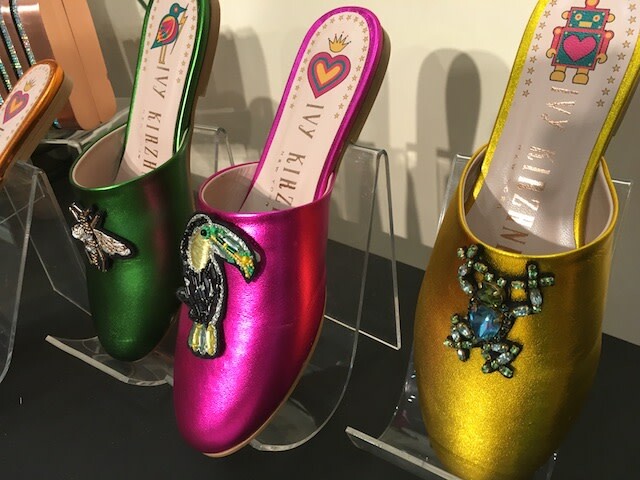 Ivy Kirzhner has a cult following, and a stocklist that includes some of the best major department stores in the world. Regardless of their fame, we give kudos. 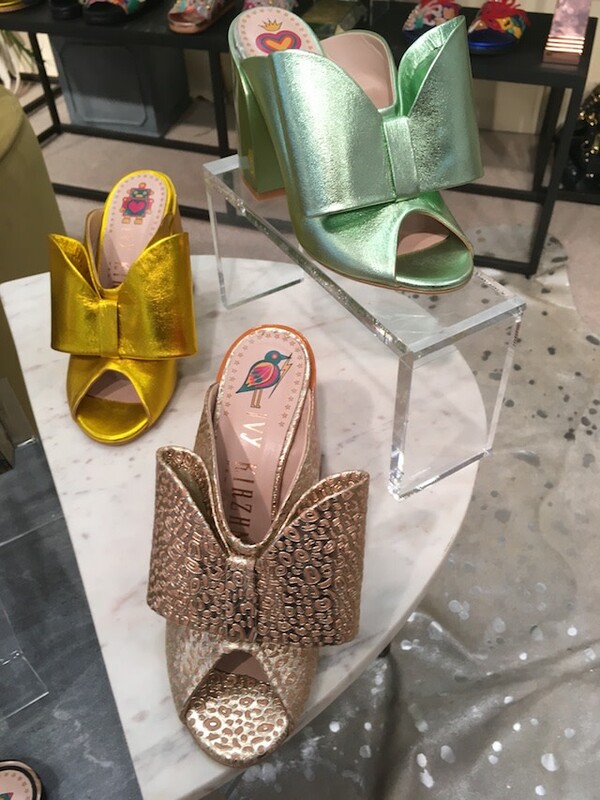 The brand turned up the glam factor this season, divining tropical goddesses for jeweled slip-on mules (top) and an iridescent “Under The Sea” take for a Burkenstockesque sandal (not pictured). 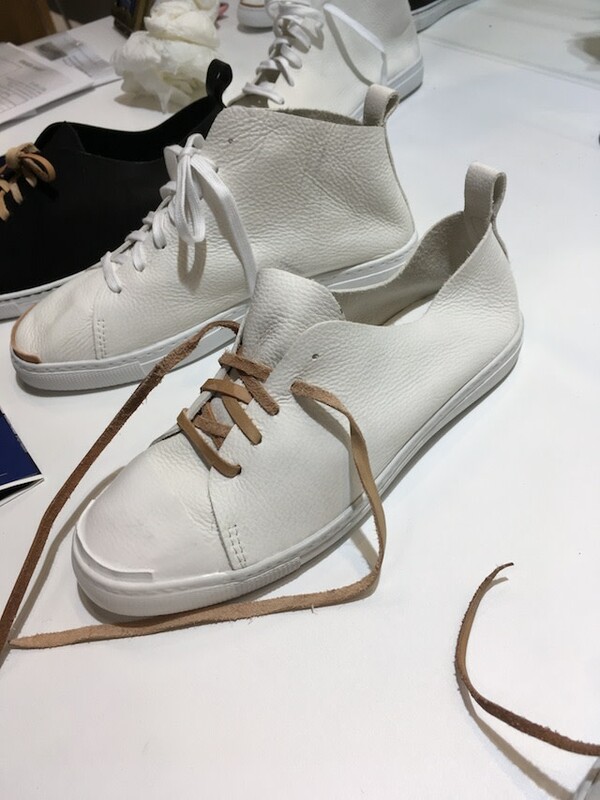 Note: the block heeled mules, replete with exploded bow, bottom picture, were there firm’s best sellers at the show. FIRST TIME EXHIBITOR. 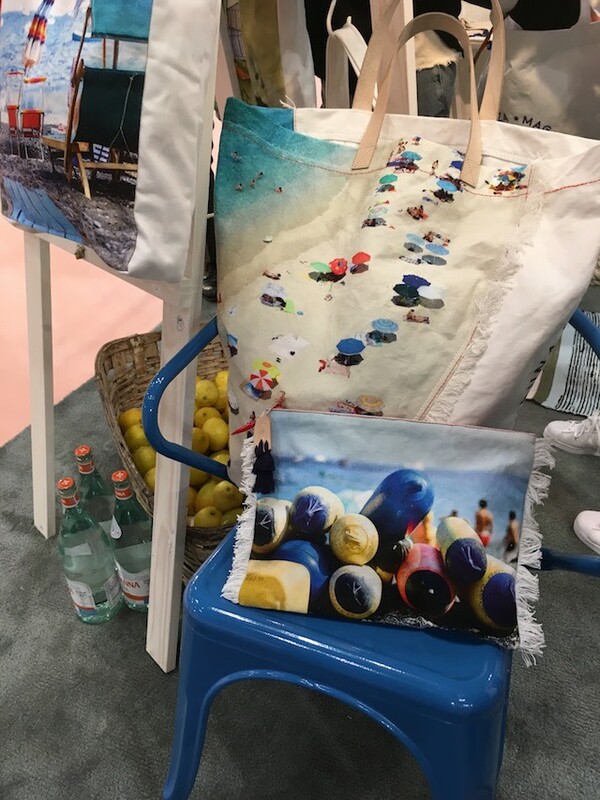 Magna Blue offered a standout collection of totes. Each piece features limited edition imagery printed on cotton canvas. The collection is a celebration of the Mediterranean heritage of its two creators: a renowned food, travel and lifestyle photographer and a lover of the saltwashed, infinitely blue summers of the region. Their refreshing easy-going collection was well received.